APPLES, APPLES & MORE APPLES! What do you do when there are so many apples on the tree? Well you make pies & filling, and sauce and rollups and juice and then you just make more until you they are all gone! And you give lots away too! The Goodland apples are ready first on our yard so when they start to fall, I start to preserve them for the rest of the year. Peel and slice apples, putting them into cold water with a teaspoon of salt or a few tablespoons of lemon juice in the water to keep them from browning. Drain when they are all peeled & cut into slices. Cover and cook them with in a large pot with 1 ½ cups of water in 8 quarts of apple slices. Cook only until they begin to soften. Add & stir in 2 tablespoons cornstarch dissolved in ¼ cup water. Stir until thickened. Remove from heat, allow to cool and divide into containers; each enough for 1 pie, depending on what size you usually make. Freeze. If you must add some sugar, just add 2 tablespoons for the whole pot, or add 2 tablespoons of honey to a pot full. When using the frozen filling for pie, thaw, spread into an unbaked pie shell, sprinkle generously with cinnamon and cover with a top crust or some crumbs. Brush the top crust with a bit of cream or milk and sprinkle on a little sugar to help it brown. 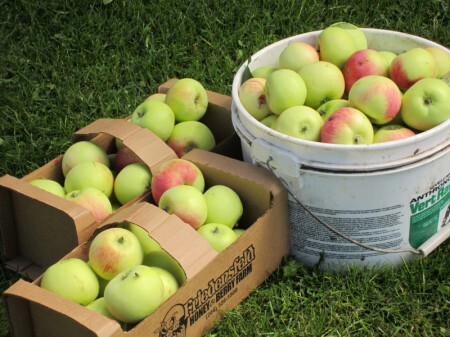 The apples we have on our tree make delicious apple pies or sauce without adding sugar. The cinnamom gives a great taste. Once we quit adding sugar we could enjoy the delicious flavor of the apples. I put a few pails of the Goodland apples into the extra fridge and we will enjoy them raw until Christmas; if they last that long! As these crabs are beginning to fall, I start by make apple sauce especially to use when making fruit roll-ups any time of the year. Without peeling them, I cut the apple off of the core as close to the core as possible. i then cook this in a large pot with water; 1 cup water to 6 quarts of cut crabs. When the apple is soft and well cooked,I press this through a strainer to remove the peels. Cool & freeze the sauce in containers. Our grandchildren love to eat a bowl full of apple sauce at any time. We do not add sugar to this. When the apples are nice and ripe they are sweet enough to make sauce. I also make apple sauce and freeze it in ice-cream pails to make into fruit roll-ups. This week I turned 8 litres of sauce into roll-ups. I pureed the 8 litres in a large pot until it was nice and smooth with a hand blender adding 2 cups of chokecherry sauce and 2 pureed lemons. (With the peel) The lemon gives a nice tart flavor and the chokecherry sauce gives a nice rich red color. I have canned over 50 quarts of pure apple juice using these crabs without any sugar in. I still have 2 more boxes of these sweet crabapples that I will still juice because that is something we do drink every morning with our powdered nutritional supplement. The steam juicer I use extracts the juice from the apples without adding any water so it is pure juice. Heat a cup of the pure apple juice (again without any sugar) in the micro-wave. Stir in a half teaspoon of cinnamon and you have a great hot drink! This pure apple juice is also great to use as a punch. Just add an equal amount of water and the same amount of ginger ale. No need for sugar again! Delicious! The recipes and information on this website have worked very well for the author. The author is not liable for loss or risk of any kind incurred as a result of the information given on this website.